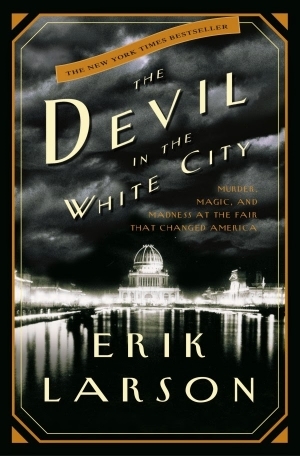 The Devil in the White City is a historical narrative written by Erik Larson and published in 2004 that explores the true events surrounding the 1893 Chicago World's Fair (otherwise known as the World's Columbian Exposition, in honor of the 400th anniversary of Christopher Columbus's discovery of the "New World"). The narrative delves into the planning and creation of the fair, as well as the evil deeds carried out by one man in the shadows of this magical global event. I have to admit first off that I have been sitting on this book for a little while now. My partner gave it to me to read so we could share in the story together. I just took my time with it since there were some sort of slow parts to the narrative (more on that later). The most compelling parts of this book (to me) are the parts that follow the dark realities of Chicago in the late 19th century, focusing mostly on the criminal behavior of one "Dr. H. H. Holmes", the alias of Herman Mudgett, one of the first documented serial killers in modern times. He was a counterfeiter, committed insurance fraud, theft, and murder. He also created a "castle" of sorts in Chicago to be able to commit many of his crimes and destroy any evidence. He was an awful human being but as is often the case, he is the most compelling and interesting part of the book since his character is just so fascinating. The parts of the book that were far less interesting to me (even as a history major) were the long passages about the tedious planning of the fair. I found myself reading these parts just waiting to get to the next section involving Holmes. The fair planning parts definitely made the book hard to get through at times, but it really picks up towards the end, so I strongly encourage folks who pick up the book to keep with it. With all that being said, there are a lot of fun little details that add context to the narrative. Both things that were of the time (the cereal Shredded Wheat was debuted at the fair) and the future (Walt Disney was said to be inspired by accounts of the fair). There are sad details and interesting ones as well that make it worthwhile to pay attention all the way through to all of the story arcs and vignettes that are told. It is said truth is stranger than fiction, and this book supports that theory. Every detail packs so much more of an emotional punch since it all actually happened. While it wasn't strong all the way through, and I would have liked it to be a little bit more concise, it is a full story of the fair and what happened all around it, good and bad. I recommend this book especially because a movie is in development now which I am very curious about. You can pick up The Devil in the White City at any of your favorite book retailers.